I was in Asheville, NC, yesterday to shoot two segments for TheQuiltShow.com, an online television show (available through subscription) featuring Alex Anderson and Ricky Tims. I was on Show 901 in 2011, teaching needleturn applique and fusible applique. This time, I’m demonstrating thread sketching and wholecloth painting. Alex and Ricky were in Asheville to feature North Carolina quilters, including Georgia Bonesteel, who was pivotal in bringing quilting instruction via television to countless new quilters in the 1970s. Such a great experience. The production crew (including Shelly Heesacker and Lilo Bowman, shown in the photo below discussing the segment with Alex and me) is simply fantastic. When I arrived, free-motion quilter extraordinaire Leah Day was just finishing up, and Jane Hall (a.k.a. “The Pineapple Queen,”) was also on set, shooting segments on pineapple block quilts. Jane and I will be featured in the same show. I’ll post about this again when I know the show number. 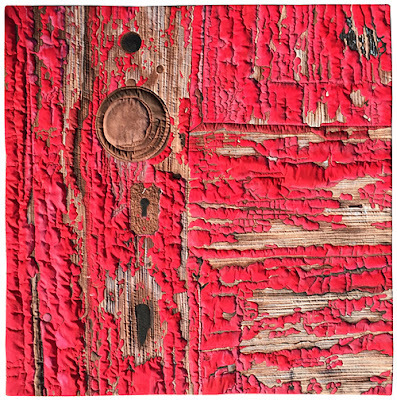 My new piece, “Old Red Door,” has been selected by curators Jamie Fingal and Leslie Tucker Jenison to appear in the Dinner at Eight Artists’ exhibition, “Affinity.” The exhibit will debut at the International Quilt Market (Oct. 24-26, 2015) and Festival (Oct. 28-Nov. 1, 2015) in Houston. It is a juried invitational exhibition sponsored by Havel’s Sewing. 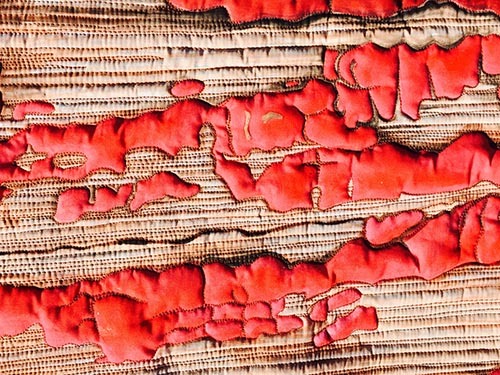 This is a wholecloth painted piece, which means that I painted the image on white fabric with acrylic textile paints, and then stitched it. For more information on this technique, please see this blog post. I am the garden that I plant. I have… a natural liking for or attraction to a person, thing, or idea. I am all the books that I have read. I have… a close resemblance or connection to someone or some thing. I have… an agreement with someone. I have… a relationship or ties to another individual. I am the sum of my life experiences.